If you come to this site for breaking news in the mustache world, you’re in the wrong place. If you come here for 3 day old pictures of people with mustaches, you’re our target audience. 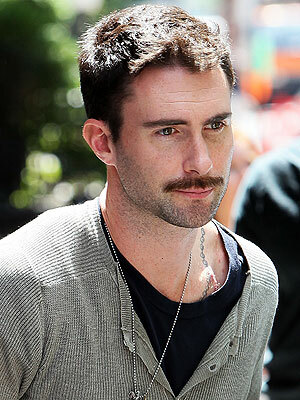 Adam Levine, who has long been the lead singer for Maroon 5, and more recently a judge on American Idol: Swirling Chairs The Voice, has found himself with a mustache, making a movie, even though he’s never acted before. It’s good to see him finally catch a break. This entry was posted in Celebrity Steesh, Movie Steesh, Musician Steesh, TV Steesh and tagged Adam Levine, american idol, celebrities, entertainment, Humor, lead singer, Maroon 5, Moustache, Movies, Music, musician, mustache, mustaches, the voice, TV on July 6, 2012 by Los Bulls.